Dubai, Oct 21, 2016 – Bose® Professional begins global demonstration events this month of its new ShowMatch™ DeltaQ™ array loudspeakers. 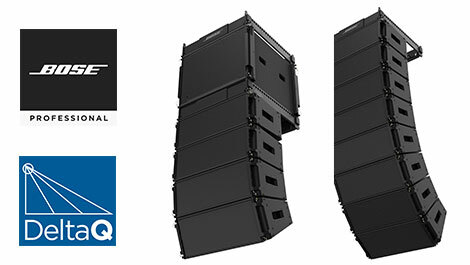 The compact and versatile ShowMatch loudspeaker features DeltaQ next-generation array technology, offering the ability to build traditional (J-Array or Constant Curvature) and DeltaQ array configurations, allowing both portable/rental and installed applications to deploy selectable coverage control. ShowMatch arrays are capable of generating a maximum SPL of up to 145 dB (peak), or when SPL is less critical, they offer the ability to achieve full coverage with fewer modules for significant weight, height and cost savings. DeltaQ originates from the ability to change directivity or “Q” for each array module. When combined in an array, acoustic energy is highly focused and can be matched to audience areas more accurately. This is an advancement from traditional line arrays, which typically have significantly less pattern control. ShowMatch full-range loudspeakers will be available in three models (5/10/20-degree vertical) and feature a compact two-way design including four improved Bose EMB2S compression drivers and two proprietary Bose eight-inch neodymium woofers. Each model ships with two sets of field-changeable horizontal waveguides for narrow or wide pattern control. Additional horizontal waveguides can be purchased separately. Removable rigging-guard/handle side caps allow ShowMatch modules to be optimized for both installation and portable applications. A companion subwoofer houses a single high-output 18-inch driver and includes integrated four-point rigging that may be deployed forward or rear-facing. A front grill-mounted NL4 connector enables easier wiring for cardioid configurations. The top of the subwoofer supports third-party mounting poles and optional accessories for ground-stack configurations. ShowMatch offers a full set of rigging accessories for up to 24 modules, mixed arrays with subwoofers, sub arrays (including cardioid sub arrays), and ground stack configurations. Bose Professional will release Modeler® sound system software version 6.9 in November to support acoustic designs using the new ShowMatch array loudspeakers. Additionally, this fall Bose will be releasing the Bose Array Tool (BAT), a new interactive design aid to support swift customer designs that optimize DeltaQ array loudspeakers for multiple applications. The versatility of the ShowMatch array design helps ensure the best possible sound quality for a wide range of applications and settings, ranging from small clubs, houses of worship or corporate AV events, to performing arts centers or amphitheaters with audience capacities in the range of 5,000 to 7,500 people. Bose Professional ShowMatch DeltaQ array loudspeakers are scheduled to begin shipping to dealers in November 2016. Demonstration events start in September and continue running through the fall for locations in US, Europe and Asia. Please contact your local Bose Professional sales representative for demonstration and product information.